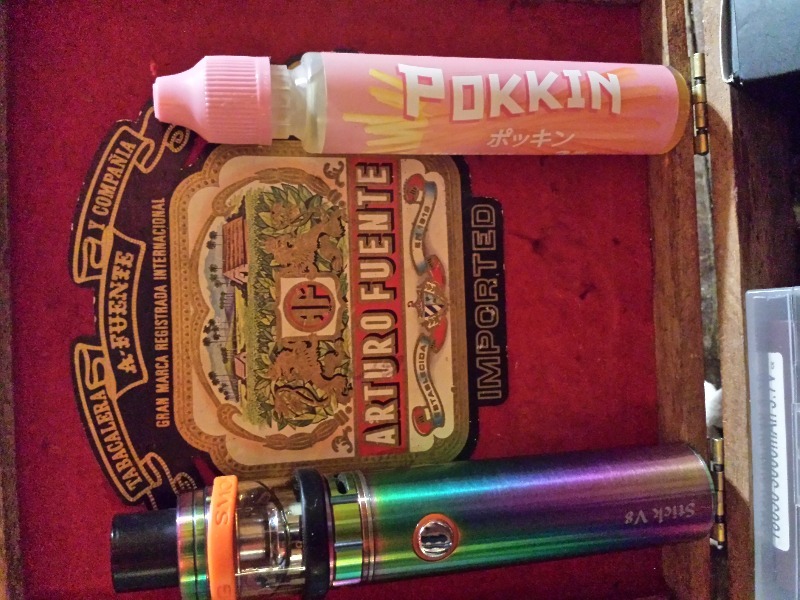 Strawberry by Pokkin is now available here at E Cigarette Empire! This delicious new strawberry flavor is one of three new flavors brought to you from One Hit Wonder. This strawberry cream flavor with a hint of cookie stick is an awesome new snack flavor that we all love here at the Empire. During the inhale you will get a crisp strawberry taste that is full of flavor and very relaxing. The exhale will give you a very creamy, milky flavor that mixes perfectly when the cookie stick sensation. This snack flavored juice is an awesome addition to your favorite dessert and fruit flavored e juices. The throat hit is super mellow and enjoyable; making it a perfect juice for you to vape all throughout your day. The packaging design is a very bright pink box that will really catch your attention. Pictured on the front is a bold white title that really stands out along with the pink stick candy that is very simple but very good looking. Included inside the box is three 30ML unicorn bottles that are a perfect size to-go bottle that you can easily take with you wherever you go. Here at E Cigarette Empire we carry this e juice in nicotine levels of 0MG, 3MG, and 6MG with bottle sizes of 90ML. This juice has has 70/30 VG/PG ratio that is well know as one of the best combinations out there! This new strawberry cream snack flavor is an awesome juice to add to your collection and we can’t wait for you to give it a try, so come check it out! ﻿Featured on our Best Vape Juice Deals 2018 blog list! My husband loves this flavor! Tastes like it went bad. Great service from the company! very nice and subtle strawberry. Great purchase and great service. Thank you!